This just a short primer on the Montreux Convention that regulates the passage of Merchant and warship through Turkish Straits. Signed on 20 July 1936, The Montreux Convention Regarding the Regime of the Straits gives Turkey full control over the Turkish Straits, guarantees the free passage of civilian vessels in peacetime and permits Turkey to remilitarise the Turkish Straits. The aim of the Montreux Convention is to regulate the passage of civilian and military ships through the Turkish Straits. 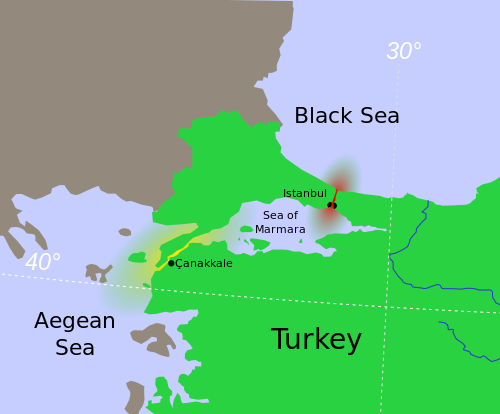 The term Turkish Straits covers the Dardanelles, Marmara Sea and the Bosporus. The Convention makes a clear differentiation between Black Sea countries (Turkey, Bulgaria, Romania, Ukraine, Russia, Georgia) and non-Black Sea countries. Merchant vessels enjoy a total freedom of passage through the Turkish Straits. Turkish Straits Vessel Traffic Services Centre regulates the passages according to the Maritime Traffic Regulations for the Turkish Straits dated 1998. The full text of the Montreux Convention can be found here. The official Turkish stand of the implementation of the Montreux Convention can be found here. You can call it however you like but if you suppose to be a respectful blog you should respect the international legitimacy. Regardless what the convention calls them, all the geographical locations you have mentioned are inside Turkey’s borders and hence they are Turkish Straits for me. On a different note, of the 9 original signatory states only Republic of Turkey still exists. So who cares if we call them “Turkish Straits”?